Home » О праве » Should Switzerland Have A Single National Language? The debate about speaking a single official national language has created a conundrum in the Swiss educational field. A number of arguments have recently been raised regarding the place of French in German-speaking primary schools. French was recently removed from the curriculum in Thurgau but that later changed after a vote in 2014. Switzerland has four official national languages; these include German, French, Italian and Rumantsch. History has it that since 1848 Switzerland’s founding fathers incorporated these languages to be officially spoken in the country, most recently however, Rumantsch was not recognized as a national language until 1938. Switzerland’s foundation grew up with all four official languages spoken. There was never a desire to supress one language over the other or exclude one or the other. Swiss German is spoken by 63% of the population, French by 23%, Italian by 8% and finally Rumantsch by 1 % of the population. Swiss-German is spoken in Zurich; the most notable linguistic feature is the use of the dialect in spoken communication and standard German in writing. French is spoken in the west of Switzerland including Geneva, while Italian is spoken in Ticino, and Rumantsch in Graubunden. There is increasing tolerance among the Swiss population for all the official languages. The Swiss constitution recognizes the rights of the various groups to communicate in their own language and provides assistance along with official documents in all of the national languages spoken in the country. Foreigners usually assume that all Swiss people speak three or four official languages but that is not the case. The Swiss population tends to stay close to their language region and consume media and information in their spoken language. There are also bilingual people in the population who speak two or more of the official languages. Having said that many might wonder should there be a need to pick up one official language. Currently neither the Swiss population nor its politicians see that coming; the country seems to enjoy the diversity of all four official languages. Nevertheless battles on language issues flare up from time to time in the media. There were numerous attempts in the media to create an official national newspaper but many experts say that is impossible. 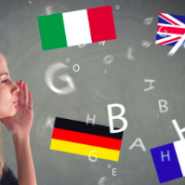 Language specialists believe that fewer Swiss are bilingual and not fluent enough to speak two or more languages on radio and TV let alone write columns. This is where English comes in; it is used as a business language between German speakers and French speakers. That is why the Swiss government is placing emphasis on English to be taught in primary schools. Choosing to learn English is practical in an ever increasingly global world, how primary school children will respond to that is yet to be seen. Bearing in mind that they also have to learn French or German, after all it might be too overwhelming for them to take it all in.